Well this was a surprise, a new XDS pistol. But wait it is not the 40SW version that people have been waiting for. If you would have asked me a year ago to predict some of the new products that would be introduced at 2014 Shot Show. 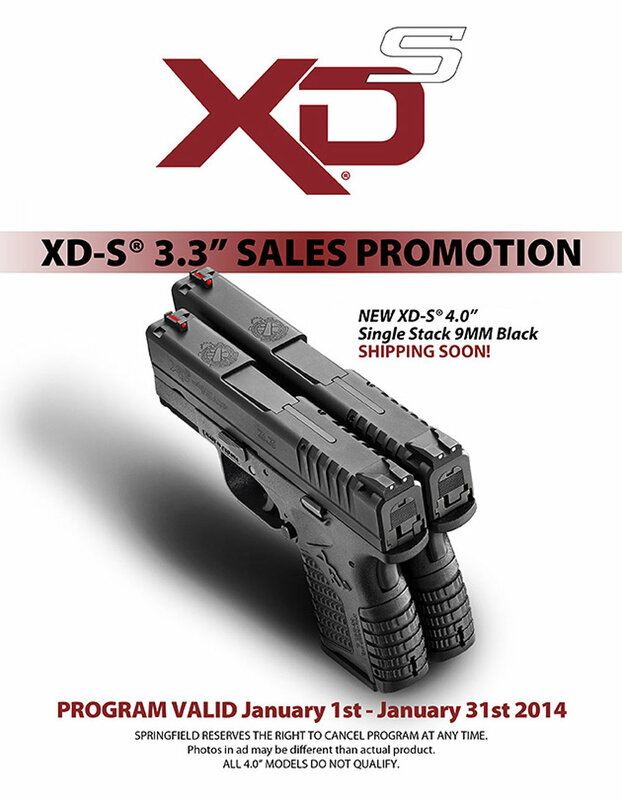 I would have bet money that Springfield would fill in their XDS line-up with a 40SW version. Then I would have adjusted after the recall, the the 40 would have been pushed back until the 2015 Shot Show. My reasoning is that Springfield & HS Produkt is still behind upgrading guns as it is. Adding a new gun just pushes what capabilities they have right? Well I was wrong and really surprised that Springfield and HS Produkt decided to still continue adding new models. 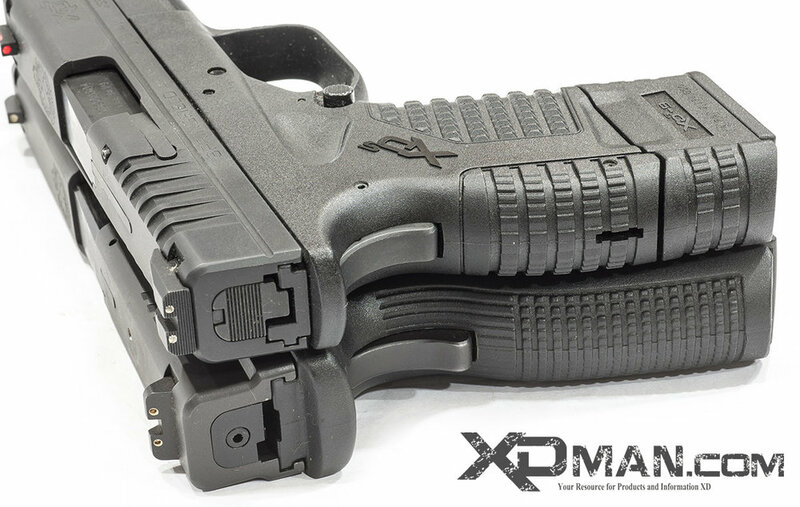 This year Springfield & HS Produkt are releasing an XDS with a 4 inch barrel. What we can gather is that the new pistol will first be released in 9mm. Remember that the original XDS was a 45acp. This leads me to believe that the sales of the 9mm out sold the 45acp version in the 3.3 models. The sales are the only reason that makes sense since with the originals I was told they went with the harder version first. In interviewing contacts from Springfield I was told that originally they built the smallest pistol they could around a 45acp bullet. Then it would be relatively easy to adapt it for the smaller calibers. That way all the aftermarket items like holsters would fit the entire line up. I will agree that the current 9mm version is softer shooting and will beat me up less than the 45acp version. I am sure that people like that. The second thing you can take away is that other than the barrel, slide and recoil assembly length the new XDS is the exact same size as the 3.3inch version. The grip and capacity will be the same meaning that your current 9mm magazines will work with this pistol. This is my speculation of why they went with this size grip over something longer. And this is the reason they have the length they do for the extended magazines. I am willing to bet that with the extended magazine this new 4.0 will balance very well and be a better fit than it was with the smaller 3.3 version. With the extended magazine this size will match perfectly as a single stack analog of the 4inch classic XD service model. Well I can not wait for the 5 inch version... imagine a polymer 1911 analog! From the ATF website: Click on the PDF and check out the full requirements. Pistols & revolvers must meet size & safety requirements and accrue a qualifying point value specified on ATF F 5330.5 (Form 4590), Factoring Criteria for Weapons. The weight will be the same since the slide needs a minimum mass to make sure there is safe lock up and reliable cycling. Even though there is in theory more metal in the longer slide. Internally there are machine cutouts in the longer slide so the pistols will weigh the same. HS Produkt uses this same technique with the classic XD & XDM pistols. Here you can see in this artists rendering what I am talking about. 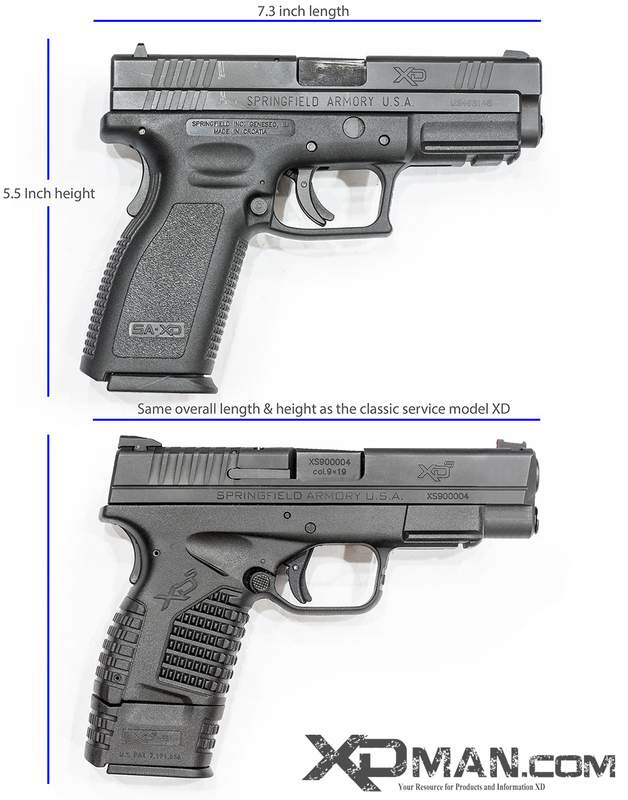 The new XDS with the longer magazine should be about the same size as a classic service model XD. Will it be exact? No not really but really close enough in concept. Here is my artists rendering, I overlay the basic size of an XDS 4.0 on top of a service model Classic XD. 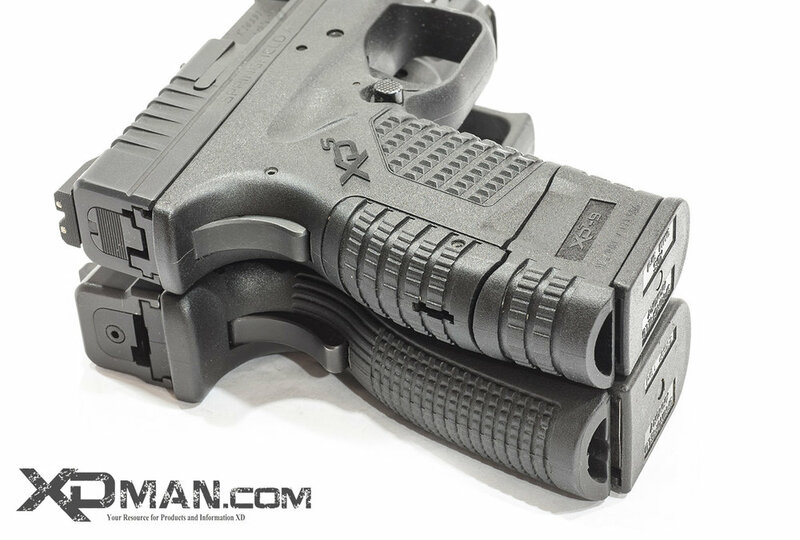 The new XDS 4.0 Frame will be the same as the current XDS. In these pictures we compare the frame of the XDS and the service model classic XD. The last picture we install a Pearce grip on the XDS frame and with the grip it somewhat matches the length of the classic XD. Jan 8 SHOT SHOW 2014 - HOW BIG IS IT?